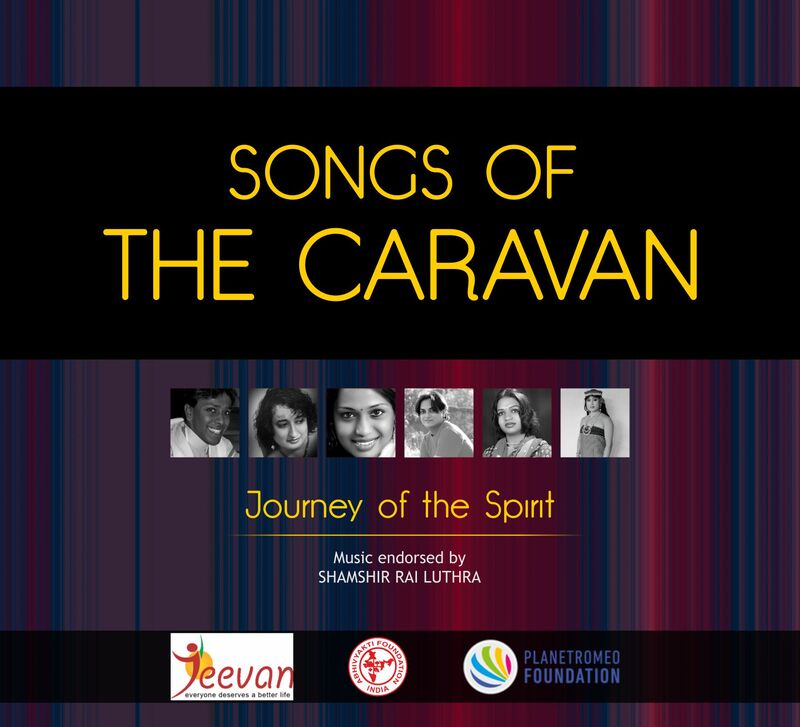 Songs of the caravan is India’s first collection of songs sung by transgender women. The album contains 13 songs in 9 different languages: a collection of folk, traditional, devotional, pop and blues music. Most transgenders in India lead turbulent lives, away from their families–they find refuge in groups of people like themselves, or with organizations that support them. They are constantly striving to be accepted by society, the government and their own inner selves. 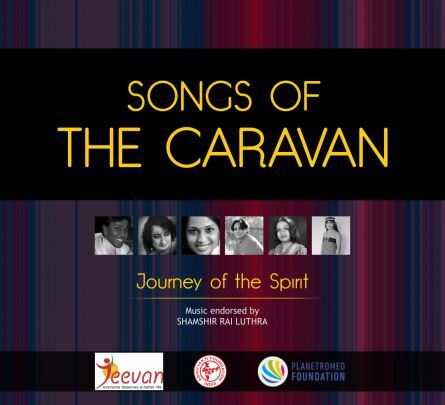 Songs of the caravan reflects the meditations of this journey: their dreams, joys and sorrows as they strive towards an uncertain future. It is as much filled with hope as it is with despair: It is the journey of their spirit, it is their caravan. The album features Akkai Padmashaili from Karnataka, Amitava Sarkar from West Bengal, Ankur Patil from Gujrat, Kalki Subramaniam from Auroville, Kanta Leisinghatham from Manipur, N. Madhurima from Andhra Pradesh, Kalyani from Mumbai and Hansa from Rajasthan. The project is supported by PlanetRomeo Foundation, Netherlands, and is Jointly executed by the Abhivyakti Foundation, Delhi and Jeevan Trust, Delhi. Before I get to the conceptualization and execution of this project, let me ask you about what I want to know the most: How has the reaction to this effort been? The question I get asked the most about the album is: Who will buy this album? I tell them, you should be the first person to buy this album, since you are so curious. Another question I get asked a lot is: Can they really sing? It never stops amazing me, how unbelievably ignorant and prejudiced we can be. I think one of the things that has kept us going is our own conviction: I have stood behind this cause with confidence that something like this should be brought out — Now I am 19 months in, $2000 in debt, and still haven’t been able to find funding for the launch of the album; but have not given up hope. The participants in the effort have been extremely supportive and understanding.. Besides launching the careers of all your featured artists, what do you hope to achieve with your album? What would you consider your biggest success? 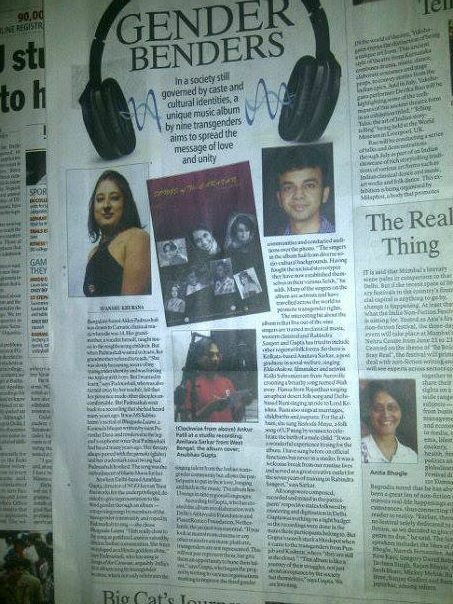 What we hope for is for our artists to be respected as artists/singers in Indian society. They are talented, and we’d like for them to be treated the way that everybody else is treated. We hope that this album will open up opportunities for them on professional and personal platforms, for them to be represented in reality television and competitions, and to simply be treated as participating, tax paying citizens of the nation. What do you believe is the biggest reason for the way that transgenders are treated in society? Lack of education, religious beliefs, or just internalized hatred/competition? Despite dealing with this hatred and bigotry on a daily basis, I cannot pinpoint a single reason for this. There was a time when transgenders were respected in India. There are historical references from the mogul era to them being treated as equals, even important members of society. I think that somewhere during the struggle against colonialism, they were left behind. I’d say that the attitude towards transgenders is owed to a mix of lack of education, politicization of religion, caste based differences, and obviously, poverty and illiteracy. What would you suggest needs to happen for this attitude to change, and for life to become better for transgenders in India? Today in India, our priorities towards helping minorities have drifted away. There needs to be a large scale advocacy for transgender groups. Not just for transgenders, but for people with a variety of genetic conditions. There should be education in schools about disabilities, genetic disorders, and children should be made aware of the fact that this is natural. Bullying in school is one of the biggest causes for suicide and depression among transgenders. Schools must set up support groups for every condition and illness. The government should set up large scale outreach, workshops for sensitivity training for children and adults alike. The problems of discrimination faced by transgenders in India are not new. Besides the general ignorance and societal pressure to discriminate against them, their portrayal in Indian film and television is often disrespectful and boorish, making them caricatures even to themselves. Even successful, usually thoughtful media-makers portray them with distaste, using them as objects for cheap laughs. This ignorance and hatred form a part of the Indian culture: transgenders are bullied for life, by children and adults alike. Transphobia and hatred are real, and they are everywhere in India. We hope that this album succeeds and goes on to dispel myths about transgender stereotypes; and offers platforms for the representation of Indian transgenders in national and global media. To donate to the crowd funded album launch of Songs of the Caravan please click here. Article originally written for Talking Cranes.